Aquarian Texture coated single ply heads? Anyone using these heads? like/dislike? Also I need to grab a set of reso heads for them.. I usually use single ply ambassadors on the bottoms..
Aquarian has a lot of fans. Some guys are diehard one brand which is of course fine. A lot of brush players like their coating which may be a little thicker than Remo or Evans, it does seems to last a little longer. I would have walked out with several packages of them. Love those TC heads. I also use Aquarian Reso's with them. Excellent pairing. 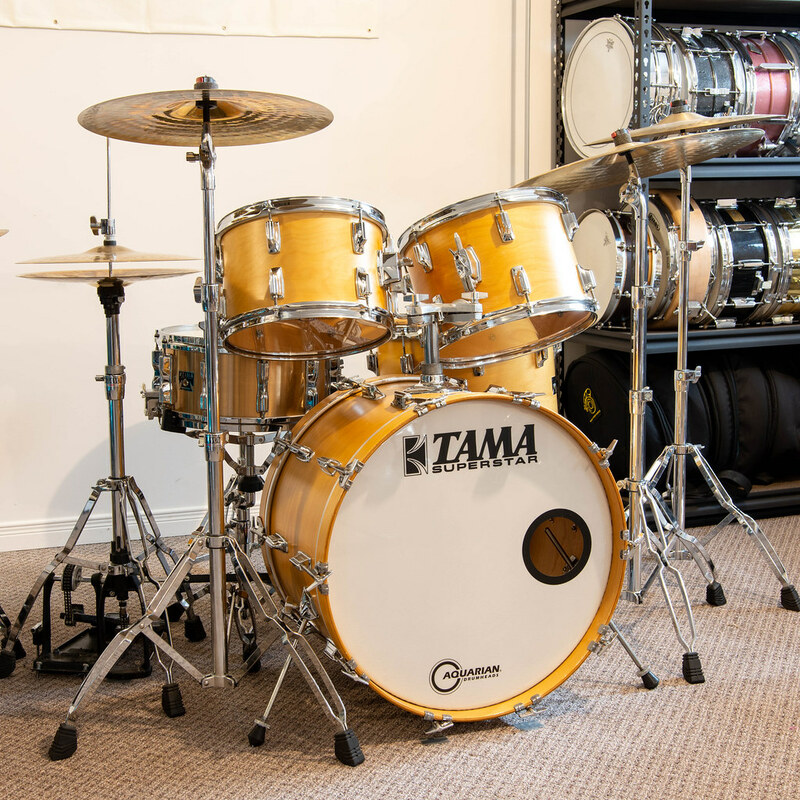 For what it's worth, I ran those on my 1979 Tama Superstar kit. Very nice sounds. Those Superstars sound good with (two ply) Clear heads and (two ply) Coated, also. So, single ply, two ply, clear, coated ... nice drums. I swapped back and forth, depending on the song. I like them. They have a softer feel (But still just as durable) different mylar than the others or at least that's the marketing behind them. The coating wears well and they sound great. They do have a wider collar than the other brands and can cause issues with fit on some drums, but I think they'll be fine on the Tamas. They are Ambassador weight so you could use them as Resos if you wanted to. Great heads at a great price. You'll like them. That sums it up perfectly for me. They feel softer which I really love. Still plenty punchy though. They're always what I try first on any drum. I outfitted every batter of my Rogers XP-8 set with them 12,13,14,16 + Dynasonic snare and they sing! Perfect heads for these drums, fat warm tone and durable coating. They're always what I try first on any drum. Same here. I often end up changing for a different TC model, like their Focus X, Super 2, or reverse Power Dot, based on the specific drum; but I start with the plain single ply TC. Recently fitted my Yamaha kit with those heads after using Remo for 43 years. Hardly mark and great w/brushes on snare. I'm planning on using TC's for batter heads on my new to me FG Fibes kit. If I found them cheap enough I'd use them as Resos too. These are good sounding, warm heads that last and last. Some find they feel a bit rubbery, but others don’t notice or seem to mind. They are warmer but a little bit duller than Coated Ambassadors. I also have them on my 1979 Superstar. Love Aquarian Texture Coated. This seems like a steal of a deal, so I'd grab 'em. Good god, that's a gorgeous set up. I'm gonna go ahead and... CONCUR! WOW!!! I use the Aquarian Texture Coated as the batter head on my two snare drums... Tama Starphonic Bubinga and Tama SLP Classic Maple. I've previously had the Remo coated Ambassador and Attack single-ply coated heads on those drums. The Aquarian is the best sounding of them all. And, yes, the coating is WAY more durable than the Ambassador. I imagine it would sound great on toms too. I use them exclusively on my snares. They last freakin forever.